TEMPE, Ariz. — The rocky economy has affected many areas of the market, but one area that has not been slapped in the face by the United State’s financial crisis is energy shots, says STG Media Corp. The energy beverage category has grown over 260% in the past 3 years and is expected to grow another 15% in the years that follow. Consumers are finding themselves working longer and sleeping less to help compensate for the rising gas prices, the plummeting stock market, and the rocky real estate market. Reaching for an energy beverage, just to make it through the day has become a routine activity for many consumers in the working class. Although the popularity of energy beverages has grown among consumers, the nutrition content of energy beverages has been a topic of controversy for health experts nationwide. According to experts, energy beverages can cause anxiety, panic attacks, high blood pressure and some kinds of stomach and heart conditions. In light of the negative rap that energy beverages have been receiving lately, Brain-Twist has developed an all-natural, healthy energy beverage and shot alternative, Slap Energy Shots. It took Coca-Cola to spot the future of energy shots (Slap Shots is partially owned and funded by The Coca-Cola Company). The difference between this energy shot and the other energy shots on the market is that Slap Energy Shots is tea based and does not have the jolt and crash effect. Additionally, Brain-Twist has combined forces with STG Media Corp. and to distribute and market Slap Energy Shots in the United States and World Wide. STG Media Corp. has developed an aggressive distribution program that will launch Slap Energy Shots into over 100,000 convenience stores within the next 6 months. The distribution will be accompanied by a print media and radio campaign that will ensure Slap Energy Shot’s success in the convenience store channel. 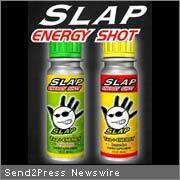 Slap Energy Shots distribution and media campaign began on November 1, 2008. STG Media Corp., STG Global Distribution and STG Interactive, LLC, work together to develop and execute strategic, national marketing campaigns. Based in Tempe, AZ, STG Media is a full-service advertising agency specializing in creative and media buying for print, television and radio. Helping clients to maximize their ad dollars, STG works hand in hand with STG Global Distribution, a master distributor and brand management company with capabilities to place products on the check-out counters in over 100,000 Convenience Stores in the USA with a proven market blitz program. STG Interactive develops cutting-edge E-commerce solutions in addition to search engine optimization and search engine marketing. STG helps clients navigate through the complex landscape of opportunities that exist within the context of modern, cross-media campaigns. For more information about the STG family of companies, call toll-free: 866-834-4370 or visit our website pr.printad.info/21.